I have been making these wings for over 25 years. When we were first married we bought an old farm-house out in Western Loudoun. It was truly in the middle of nowhere and so beautiful. The house was well, worn out, but full of romance. On a windy night the candles would burn down one side due to the draft around the old stone fireplace. We would sleep in down vests. When Sunday rolled around and the grocery money had been spent, there was always enough pocket change to buy a package of wings, frozen baby peas and rice. When the smell of these wings fill the air, I know I’m home. Arrange the wings skin side up on the cookie sheet in a single layer and pour any sauce in the bowl over them. 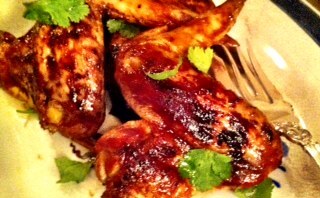 This entry was posted in Recipes and tagged chicken, chicken wings, hoisin sauce, Sesame Oil, soy sauce. Bookmark the permalink.